This archive is embedded in my practice based PhD research. It provides a dynamic mechanism through which the visual documentation can be experienced by a wider audience. While this archive has evolved through the reflexive processes of capture, accumulation and preservation, it purposefully sets out to respond to the reserach themes of graffiti's multimodality, situatedness and place. It is hoped that through user engagement this archive can shift negative perceptions about graffiti as a form of damage to cultural heritage. Moreover, I hope to collect stories (through comments and discussion topics) about the viewer's memories and experiences of place enacted through the graffiti and triggered by these photographs. 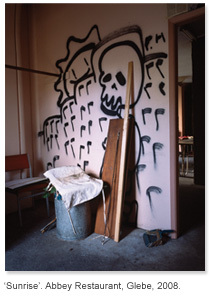 A significant proportion of this collection is devoted to shedding new light on the underexposed territories of graffiti and urban art production - the interior and subterranean. Graffiti is largely produced in public spaces, such as streetscapes. Graffiti is however, not always visible or easily accessible. Image and text based modes find their way into and onto the places in-between and deep within the bowels of the cityscape; derelict interiors, squats, drains, tunnels, forts and batteries.